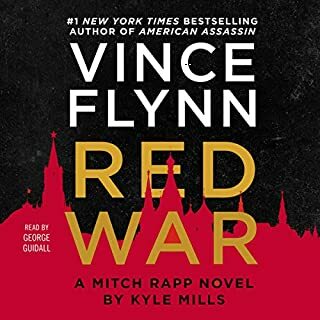 This Mitch Rapp novel fell well below expectations. A shocking attack in Ankara leaves the US Ambassador to Turkey dead and his chief of staff, Amanda Allen, in the hands of brutal terrorists. But Allen is no ordinary diplomat. She’s undercover CIA. 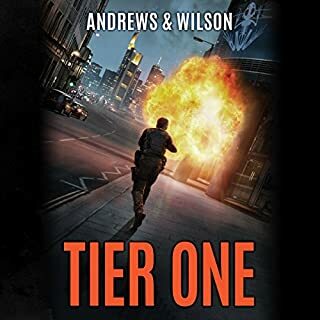 The DNI and the President turn to Ember, America’s premier black-ops task force, and its deadliest weapon, former Tier One Navy SEAL John Dempsey, for help. To find Allen, Ember gets embedded in the most dangerous battlefield on Earth: Syria. But when all communications are disabled by an attack in Turkey, Dempsey finds himself with no backup. Top-secret data has been stolen from the CIA, and the only man who knows its hiding place is dead. 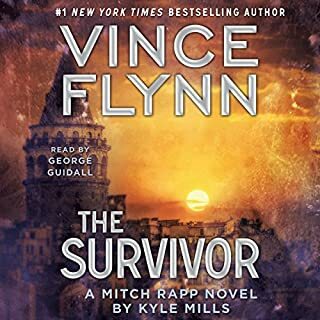 CIA operative Mitch Rapp must race to find the classified information in this blistering novel that picks up where The Last Man left off in Vince Flynn's New York Times best-selling series. 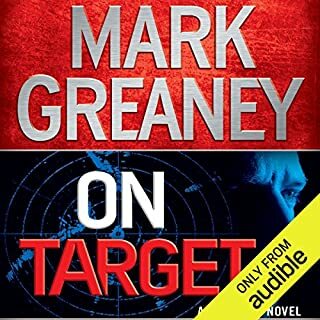 Mark Greaney, the New York Times best-selling coauthor of Tom Clancy's Jack Ryan novels, delivers another breakneck thriller following the world's deadliest assassin - the Gray Man. After five years on the run, Court Gentry is back on the inside at the CIA. But his first mission makes him wish he had stayed on the outs when a pair of Chinese agents try to take him down in Hong Kong. Normally the Chinese prefer to stay eyes-only on foreign agents. So why are they on such high alert? 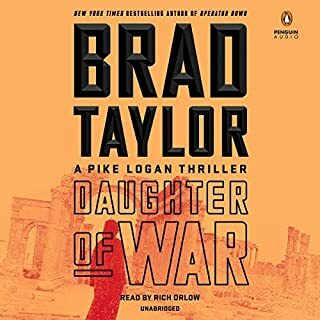 Court's high stakes hunt for answers takes him across Southeast Asia and leads to his old friend, Donald Fitzroy, who is being held hostage by the Chinese. Fitzroy was contracted to find Fan Jiang, a former member of an ultra-secret computer warfare unit responsible for testing China's own security systems. And it seems Fan may have been too good at his job - because China wants him dead. The first two kill teams Fitzroy sent to find Fan have disappeared, and the Chinese have decided to "supervise" the next operation. What they don't know is that Gentry's mission is to find Fan first and get whatever intel he has to the US. After that, all he has to do is get out alive. 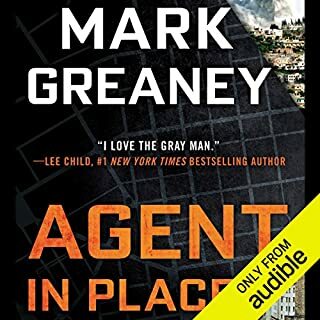 ©2017 Mark Greaney (P)2016 Audible, Inc.
a bit Hollywood at times but it's a great read and suspenseful when necessary. definitely would make for a good movie adaptation. I have enjoyed all of the Gray Man novels. I particularly enjoyed the fact that he met a female version of himself. I really hope they get to work together again. 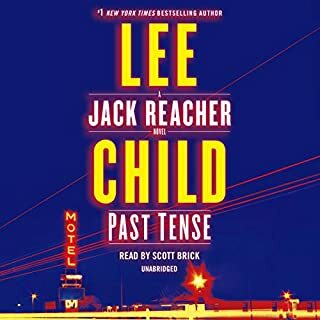 I could not stop listening to this book it only took 2 days. I enjoy Jay Snyder’s soft spoken voice of Court Gentry hope he continues to be the voice of the Gray Man. I stayed up all night to finish, "Gunmetal Gray!" The story is fluid, with a heavier emphasis on action/adventure than espionage compared to the last 2 books. It is an enjoyable read, although it suffers from the fabulous success of the previous Gray Man, "Back Blast." 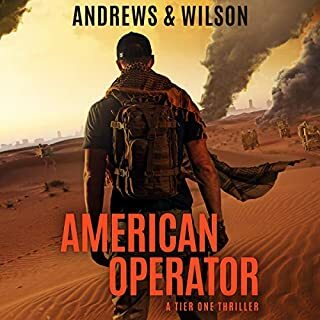 Without giving away spoilers, I loved the interplay between the shadowy criminal organizations, spy services, hacking, government commandos and exotic locales. Frankly, I liked it so much that I would have enjoyed a few more hours worth of details. Jay Snyder did a superb job with the narration. His many voices, accents, and tones make the characters come alive. If they ever make a movie, they better dub in his voice to make sure the movie is as realistic as the book! P.S. Not that it matters, but "Back Blast" was the best action/adventure/espionage thriller that I've read since Ian Fleming's most outstanding achievement, "From Russia with Love." It occurred to me while writing this review that the 5th James Bond book and the 5th Gray Man book were also the best in each series. Both books were hard, if not impossible acts to follow! Yes. Non-stop action, great performance! 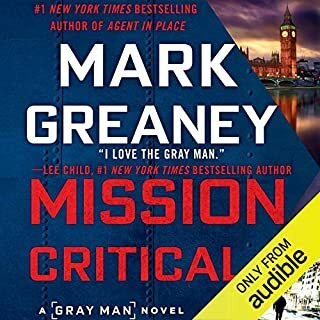 Mark Greaney is the #1 New York Times Best-selling co-author of more than six books in the Tom Clancy’s Jack Ryan series and this month he released the 6th thrilling novel in his own, original, Gray Man series. If you’ve followed my blog posts over this last year you may know that I’m a big fan of Mark‘s and that I always devour his works with abandon. 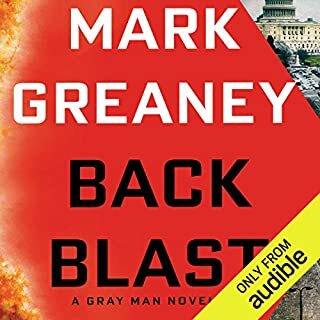 In Gunmetal Gray, Court Gentry aka The Gray Man is back with his old employer at the Central Inteligence Agency and the action takes place right after the events of the last year’s fantastic Back Blast. 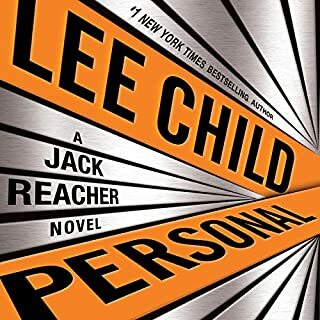 Court is sent into Hong Kong in a solo mission with orders to kidnap a Chinese hacker and to rescue an old friend, but when he is recognized at the airport by Chinese operators in the intelligence Bureau all his plans are out the window and The Gray Man is on his own. Without me giving anything of the plot away, I will say that although Gunmetal Gray is not quite as intense as its predecessor, Back Blast, the story is great, the action is non-stop and the Gray Man is deadlier than ever… The are guns, explosions, hand to hand combat, gadgets, boats, spies, special operators of all kinds, hackers, women whom at the same time are beautiful and deadly. There is betrayal, blackmail, murder and a lot of intelligence agencies are battleling one another, fighting to get their hands on the hacker before Court does. I loved the breakneck speed with witch events develop, I enjoyed the race from country to country, the Gray Man‘s resourcefulness to conquer any situation, the cat and mouse games and the timid love story developing between… well, I’ll let you find that out on your own. 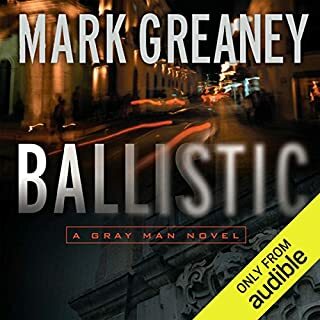 This Gray Man audiobook is brought to life once again with talent and passion by the great actor and voice over artist Jay Snyder. His voice reminds me of Snake from the Metal Gear Solid series of video games, he can read, act, prelongue the tension and infuse action scenes with urgency. He even sounds good performing all the words in different asiatic languages. For Gunmetal Gray he uses lots of accents and voices, from gruff Russian for pissed off operatives, to scared Chinese henchmen, dialing it down to calm and even feminine cadences. He is perfect for this series and it’s obvious that he enjoys the role. 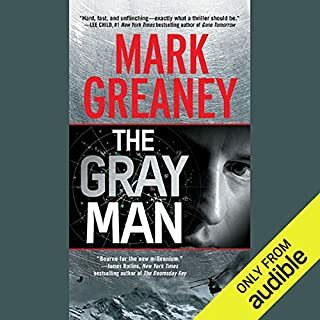 I said it lots of times and I’ll say it again Mark Greaney is one of the best thriller / espionage writers of the moment, Gunmetal Gray is intense, unputdownable and thrilling from beginning to end. I saw Mark evolve with every book and and I can’t wait for the next one in this great series! 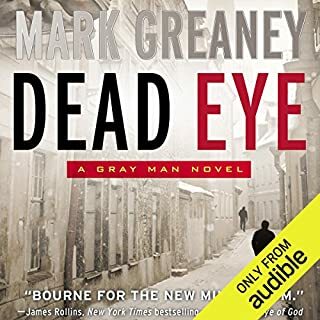 If you enjoy works by authors like Robert Ludlum, Tom Clancy and Vince Flynn you’ll love what Mark delivers with the Gray Man series. 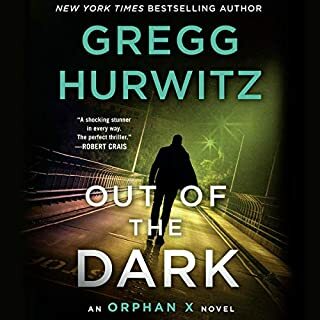 Please vote Yes below if you liked this review and check out more at theAudiobookBlog dot com! Greaney sets the bar even higher. I am completely addicted to the characters and story. I love the fact you are transported into the story. I hope there will be another book soon!!!! Court Gentry is back, in the somewhat good graces of the CIA. He has a new handler, a desk jockey who's never seen a bit of action in her life, and a new assignment. He doesn't have all the information on it and soon he is flying by the seat of his pants, with no help from the CIA. 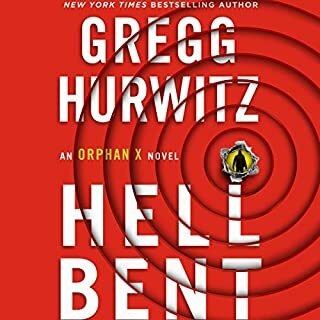 An old friend, Donald Fitzroy is being held hostage by the Chinese and Gentry is willing to do anything that it takes to get him back. This takes him all over Asia, crashing into several gangs and his team of Russians. 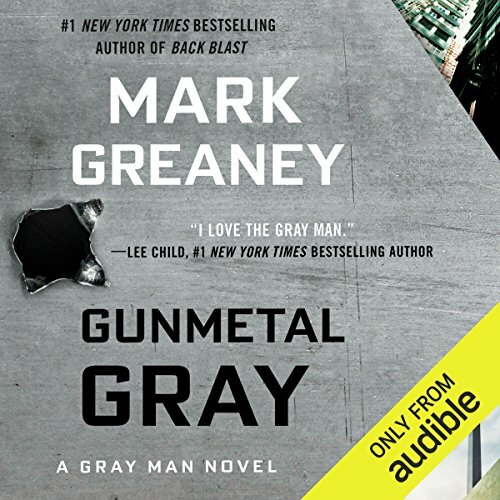 Gunmetal Gray is another outstanding book in the fantastic series written by Mark Greary. Greary. Court Gentry helps fill the void from Vince Flynn's Mitch Rapp series. I cannot wait for the next book to be released sometime in 2018! Jay Snyder is perfect in his voice performance of Court Gentry and the characters that surround him. Excellent! Listeners should be warned that there is some strong language and descriptive violence. Please take a moment and select the 'helpful' key below my review if you feel it warrants it. I also invite you to share, vote and read any and all of my reviews. 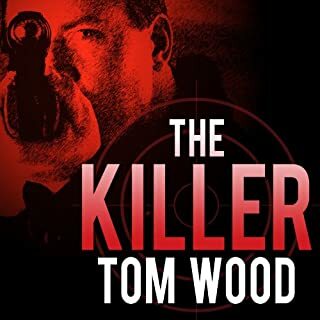 If you choose to 'follow' me on Audible, you will receive my latest reviews. Thank you so much! I appreciate the genre of the testosterone special agent league, but I just couldn't embrace this book. It's all just a little too silly. 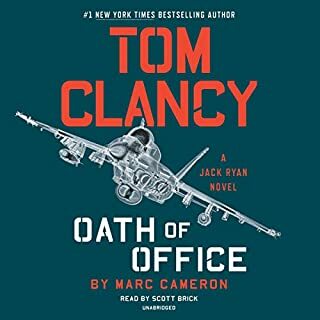 The narrator sounds like your ex football coach, the antics are impossible and the gratuitous nod to strong women feels like- well- a gratuitous nod. Maybe its the current political climate, but all of this intrigue and moral acting out within the CIA feels tiresome. This is book six in the Gray Man series. It is important to read these books in order. Courtland Gentry is a CIA agent turned freelancer. The CIA send Gentry to Hong Kong. He is to find and bring out a Chinese Defector, Fan Jiang. Fan Jiang is a cyber warfare specialist for the Chinese Government. His parents just died in an auto accident. Now that he has no family, the cyber-unit is out to terminate him because they no longer have leverage control over him. Fan wants to go to Taiwan, but the CIA wants him, as do the Chinese, the Russians and a Vietnamese gang. The book is well written. Greaney co-wrote several of the Tom Clancy novels. Greaney creates an intricate plot. The story weaves in the exotic scenery of the orient. The action, excitement and tension is never ending. If you enjoy none stop action this is a book for you. The book is about seventeen hours long. Jay Snyder does an excellent job narrating the series. Snyder is a voice over artist and an award-winning audiobook narrator. This is a more complex and fulfilled effort than the previous books. Although the use of multiple points of view is often a narratorial convenience or indulgence, it does enable Greaney in this book to complicate matters for the protagonist and justify the length of the book. It's a fun read, with lots of the drudgery of spycraft, a femme fatale, lots of shifting allegiances and the rest of the cliches of the genre assembled here in a pleasing fashion. The narrator is pretty much the right guy, though in a book this long the occasional misstep appears. The overall efect is very satisfying, but the characters are drawn from a limited pallette, and the efforts to humanize the gray man fall short of rendering him even in pastels . . .